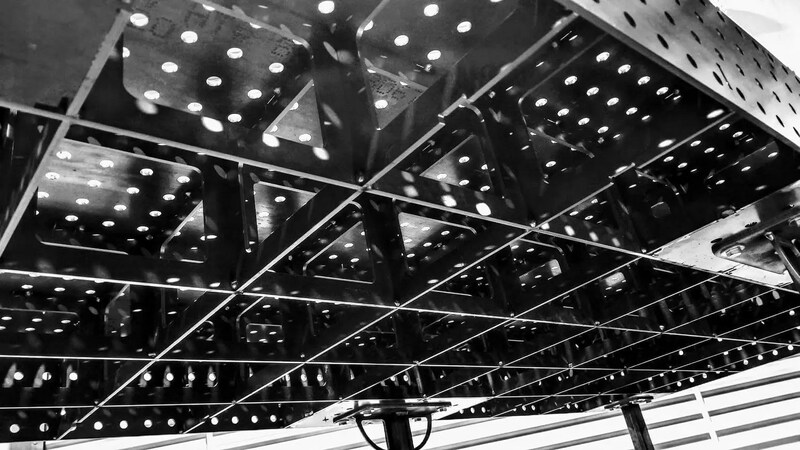 Welding tables from Texas Metal Works are computer designed, CNC cut, and professionally assembled to give years of service in demanding environments. Our 50″ x 100″ weld tables are the best value in the industry! Texas Metal Works offers fully fabricated tables shipped FREE for the same price (or less) than other DIY kits – saving you time, hassle, and money! Get down to business with a Texas Metal Works table. A full 50 inch wide x 100 inch long work surface. 8 inch table sides also allow fixturing. Accommodates 4 foot x 8 foot materials with room to spare! 1,850 precision CNC cut holes. Accommodates Stronghand and similar tooling. Fabricated from 1/4″ A36 structural steel plate. Professionally assembled, and guaranteed forever! 2 in x 1/4 in gauge heavy tubular steel framing and legs. 41″ surface height (can be customized). 5″ swivel casters with brakes rated over 600 pounds per wheel. Non-marking polyurethane wheels with iron hubs. Complete tables are built from dozens of CNC cut parts, which is just one key component to the overall accuracy of the finished product. Optional leg kits are fabricated from 1/4″ wall 2″ tubular steel. We routinely load 2,000 pounds of material on these tables with absolutely no problems. The strength and flatness of a Texas Metal Works weld table comes from the interlocking series of ribs supporting the surface. These precision cut ribs lock together and interlock with the table surface. 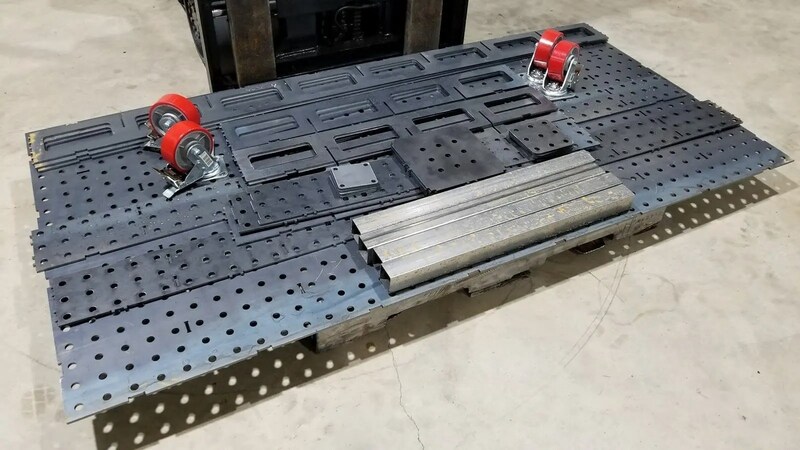 Since each of the ribs is extremely straight (having been cut by a robot), when the welding surface is clamped securely to the ribs it ensures a super flat table top without twists or bends. 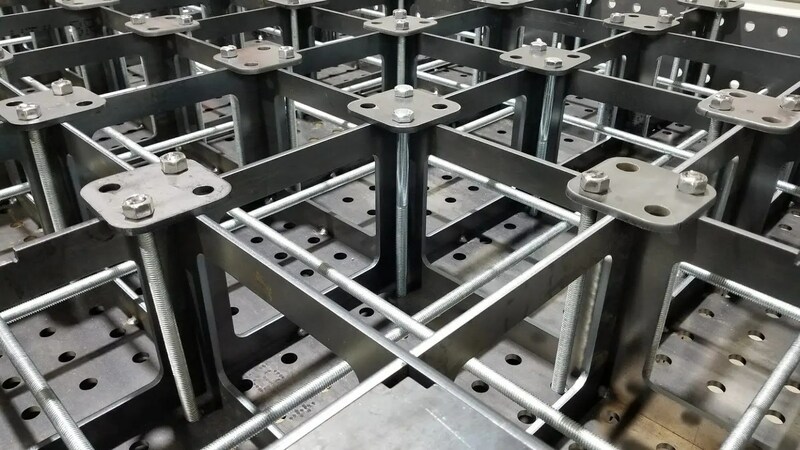 After fixturing the weld table and ensuring everything is tight and flat, hundreds of welds are made to lock things in place!